"Chiropractic" comes from the Greek word chiropraktikos, meaning "effective treatment by hand." Chiropractic is primarily used as a pain relief alternative for muscles, joints, bones, and connective tissue, such as cartilage, ligaments, and tendons. It looks to address diseases not by the use of drugs and chemicals, but by locating and adjusting a musculoskeletal area of the body which is functioning improperly (Source). Although chiropractic is used most frequently to relieve back pain, studies have found it to be effective for a variety of conditions, such as migraine headaches, neck and shoulder pain, carpal tunnel syndrome, fibromyalgia, and infantile colic. All treatments are done according to your tolerance. If your condition is more acute, then much less pressure is applied than would be used after several treatments when the condition is improving. Cost varies depending on several factors. Please contact our office for a general idea of cost of services. If you have insurance, bring a copy of your insurance information for your first visit and we will then contact your insurance company for your chiropractic benefits. Yes! We are in network with almost every insurance company in our area. If you are unsure if we are in network with your insurance company, please call Mohr Chiropractic and ask one of our friendly staff. Yes. We often communicate with medical doctors in the area. Dr. Mohr has a great relationship with various healthcare providers in Hendricks County. We will refer patients to medical doctors if we feel like they need medical attention and several different medical doctors’ offices refer patients to see us for chiropractic care. Chiropractors are direct access health-care providers, which means patients may contact us directly without the need for a specific referral. However, certain insurance policies may require some type of referral but our staff will be able to assist you if this is the case. For certain cases, treatment may be performed, but typically, your first visit consists of information gathering. Dr. Mohr studies the health history information, exam findings, and diagnostic tests and comes up with a treatment plan specific for each patient. The patient is usually scheduled for a follow up appointment upon which Dr. Mohr reviews all information with the patient and presents his recommendation of care. Can someone that has had back surgery see a chiropractor? Yes! We see many post surgical fusions, disectomy, laminectomy, patients. The treatments sometimes need to be gentle but they can be very effective relieving pain even if surgery was not very effective. Will I get a prescription for pain medication? No you will not get a prescription for pain medications here. We cannot prescribe medications of any kind. We will be happy to refer you to a medical doctor in the area that can prescribe medication if we determine that is what you need. The first thing a chiropractor will do is ask you about the health complaints about which you are chiefly concerned. We will also ask about your family history, dietary habits, other care you may have had (chiropractic, osteopathic, medical, etc. ), your job, and other questions designed to help determine the nature of your illness and the best way to go about treating the problem. A physical examination will be performed in accordance with our clinical judgement, which may include x-rays, laboratory analysis and other diagnostic procedures. 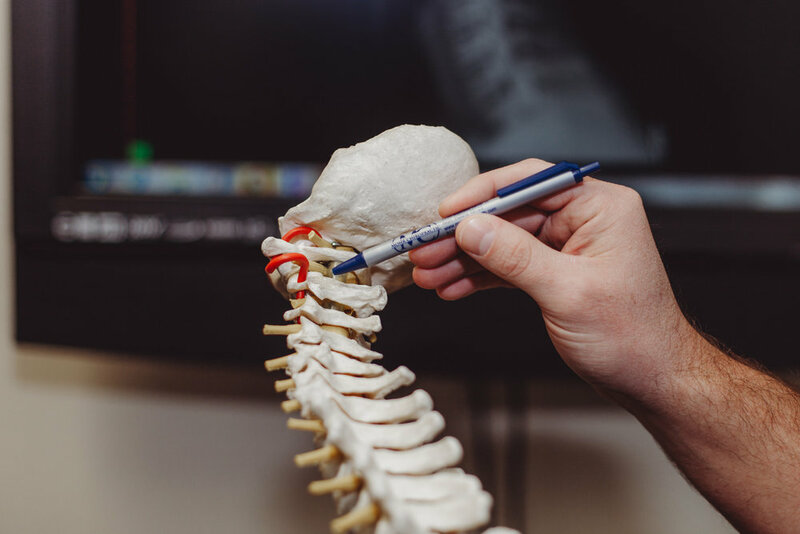 In addition, a careful spinal, neurologic, and orthopedic examination and analysis will be performed to detect any structural and soft tissue abnormalities which may be affecting or causing your condition. All of these elements are important components of your total health profile, and vital to the doctor of chiropractic in evaluating your problem.